Rabies is a viral disease that causes acute encephalitis in warm-blooded animals. The disease is zoonotic, meaning it can be transmitted from one species to another, such as from dogs to humans, commonly by a bite from an infected animal. 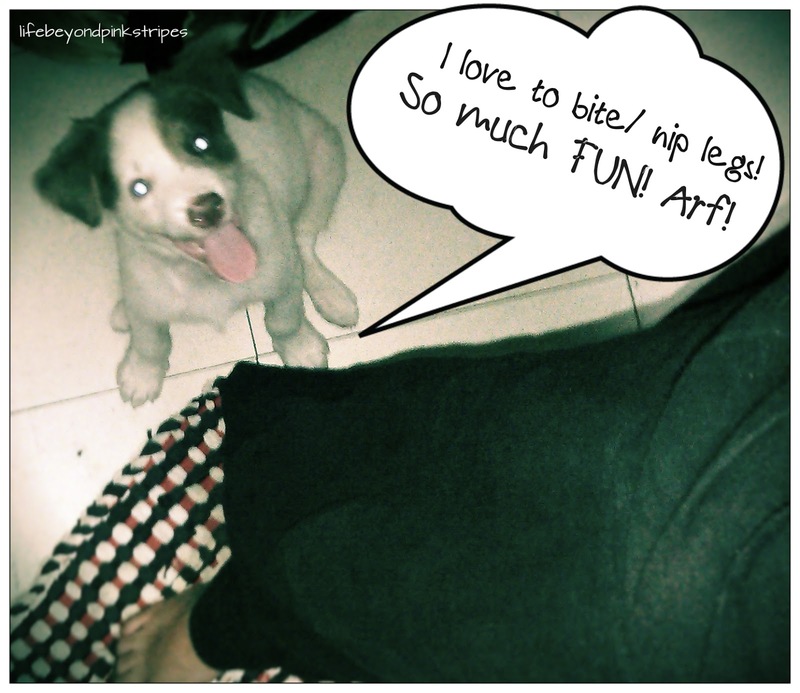 Last Sunday, Jiggly happily nipped my leg but got a little too rough that I ended up having shallow skin scratches. There wasn’t any bleeding though but the epidermis was somehow broken. Unfortunately, our pup hasn't received anti-rabies shots yet due to his young age which is just a little over 2 months. 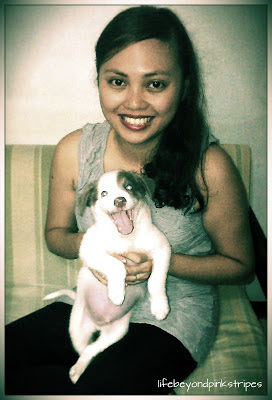 Though convinced that Jiggly's "clean" plus my pocket's not too happy to shell out moolah haha, I decided to have myself vaccinated with anti-rabies just to be sure. It took me 5 days before I was able to go to an animal bite clinic (Heaven Animal Bite Clinic located in San Mateo, Rizal). To my surprise, there were lots of patients even though it was already evening. I didn't realize until then how animal bite could be very widespread. To be honest, I'm scared of injections haha. The doctor let the anti-rabies vaccine flow just right under my skin by means of a small needle. With my eyes closed, I stopped breathing for a few seconds. After "recovering" from the ordeal (LOL! ), I was advised to be back after 3 and 7 days to get more shots. Since the "bite" took place on the 23rd of June, I was given until the 8th of July to monitor Jiggly. If he dies (oh no! ), then that's a definite sign of rabies so I need to complete 5 rounds of anti-rabies shot. If he remains healthy, which I fervently pray, then I could relax and stop at the 3rd round of vaccine. 1. Monitor the animal for 14 days from the day of the bite. 2. DON’T KILL THE ANIMAL IF IT IS STILL HEALTHY. 4. If the animal dies during the observation period, bring its head immediately to any laboratory for rabies test. 5. If the animal gets sick during the observation period, bring it immediately to the nearest veterinary clinic. 1. As much as possible, avoid alcoholic drinks, steroids and medicine for malaria. 2. For those vaccinated with ERIG and ATS, avoid chicken, egg, crab, shrimp, shrimp paste, fish sauce, fish and food with preservatives such as tocino, longganisa etc. 3. 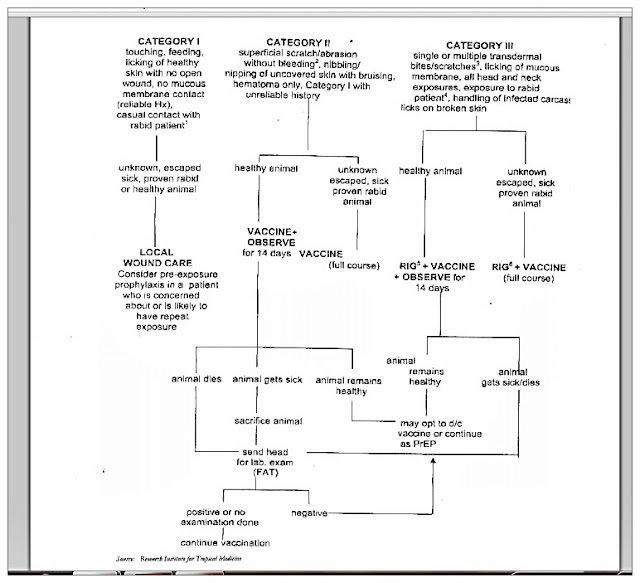 The skin area where vaccine [Equine Rabies Immunoglobulin (ERIG)*/ Human Rabies Immunoglobulin (HRIG)*/ Anti Tetanus Serum (ATS)/ Tetanus Toxoid/ Purified Vero Rabies Vaccine(PVRV)*] was injected may appear red, swollen, and could be itchy right after vaccination. It could be covered with warm towel for the symptoms to subside. *Types of Anti-Rabies Vaccine --- It's best to consult a doctor to gain further understanding on what each one is. It was made clear by my doctor though, the type of anti-rabies vaccine initially injected should also be the same as the succeeding shots during the vaccination period. No mixing. 4. If fever occurs after receiving the anti-rabies shot, paracetamol may be taken as medicine. 5. Consult the doctor if after vaccination, any of the following condition is experienced: extreme itchiness, redness/rashes spreading from the vaccinated skin area to the whole body, difficulty in breathing and continuous fever. 6. The schedule of vaccination must be strictly followed. In case of failure to do so, it is important to call or visit the clinic as soon as possible to know the next course of action to take. Always bring the Vaccination Schedule Card. Click link for larger image. Thanks for the informative posts Ms.Golda. I hope ok na po kayo ni Jiggly. God bless! Glad to hear you and Jiggly are both doing OK! What a cute photo! That's a very informative post, thanks for all of the public health information on rabies. Ate Golda how much cost nung 3 sets na vaccine? Awareness is the key to safe owners and healthy pets. Kudos to you Golda! You sure did take time to let everyone know what actions to take when this kind of situation happens. By the way, Jiggly's cute. He looks like a Jack Russel Terrier. Hi! where is Heaven Animal Bite specifically? do you have landmark? Hi! :D Heaven Animal Bite Clinic is located in Banaba, San Mateo, right across PUREGOLD. It's also near the area where Batasan Road-San Mateo intersects with Gen. Antonio Luna Ave.
hi! did you have fever or like trangkaso after having your first shots of anti rabies and anti tetanus? hi! thanks for this very informative post. I was also bitten by my dog last night. But since he's already had his rabies shots just recently, I'm pondering on whether I should get the vaccine or not? The bite did pierce my skin (hand area) and it bled..so maybe I should get the vaccine just to be on the safe side. Btw, do you have a contact # for the Heaven Animal Bite clinic? Thanks for this post Maam! Just the info I need! ATS +Syringe P50 tapos Anti-Rabies free nung unang shot saken,pero nung sumunod na balik ko wow ERIG 12.6ml at PCEC sa SLH, natepok kase yung pusa,tapos sa Dec 23 babalik last shot ko na sana..
Good day! Heaven Animal Bite Clinic is in Banaba, San Mateo...near the area where Batasan Road-San Mateo connects with Gen. Antonio Luna Ave. Its building (same as Kumon's) is located right across PUREGOLD. As for the contact number, I only have the mobile number of the clinic's doctor, Dra. Garcia --- 09055576354. As I've mentioned in my previous reply, she has insomnia (according to her) so she usually replies at night. Hope all is well with your kid. Thanks! HI. I got bitten by my own pet dog last Feb 4. I was just hugging him which i normally do kaso bigla sya nagalit and bit me on my upper lip. It bled a little pero as advised, hinugasan ko, put pressure on it and applied ointment. Di ako mapakali, I went to three private hospitals to seek for advice, ang sabi San Lazaro daw. So I went there the next day/ I was done with my 2nd shot yesterday (Feb 8) and will have my 3rd shot on Feb 12. When I asked doctor if I need to take ERIG sabi nya..to be safe lang daw. What if on the 10th day eh mamatay ung aso, it might be too late na. But while I was taking my shot of vaccines, ang sabi kapag ka ika-3rd shot mo na at buhay naman ang aso, its ok not to take the ERIG anymore. Now I'm confused and undecided. Ok naman ung aso, kumakain, healthy, kaya lang di na sya lumalapit sa kin para maglambing although he would wag his tail everytime I would call his name. Lalapit sya pero takot na ko sa kanya. What do you think? Should I take the ERIG or not? Medyo me side effects pa ang vaccine sa akin, feeling drowsy, nanunuyo na labi, and parang me lump sa throat ko. Or am I just being paranoid? Pls. help!!! I am really sorry for this delayed reply. :( I am assuming that by now, you have already gotten your 3rd shot. I hope everything is ok now. If you still have doubts, please consult your doctor...he/she would be the best person to advise you if you should take ERIG or not. Hello. I have a question, what if i already got my anti rabies vaccine completed last june 26 so it was already 10 days ago. Yesterday I accidentally inserted my pinky finger inside my nose without knowing if that finger has the saliva of the dog. Im not sure kasi kung may anti rabies na yung dog e. Di ko na rin matandaan kung nahawakan ko ba talaga yung sofa. Di ko rin sure kung nadilaan ba o inamoy lang ng dog yung part na yun ng sofaso ayun. Im beimg paranoid nanaman. Magkakarabies ba ako dun sa nagawa ko? Oh, thank you so much :) medyo nag calm down naman na ako kahit papano when I read that :) thankyou so much po :). Hello po uli, satingin mo po pag nagtouch ka po ng dog kahit sa head niya lang ano mas better po na gamitin pang clean ng hands, soap and water or alcohol po? Can I consult your doctor the one that gave you the vaccine? Do you think its ok to ask her opinion? Thank you for you kind insigth and reply. You think ma'am I can consult your doctor that gave yo the vaccine. Hi Brenard, yes, you can try contacting Dra. Garcia. Her number is 09055576354. Or you can visit her at Heaven Animal Bite Clinic located in Banaba, San Mateo, right across PUREGOLD. If I remember it right, her clinic opens in the evening only. after the vaccine at the night from went to hospital. take rest well. tomorrow, i saw to dog was died at the morning. how to solve it? help me? after the vaccine from hospital at the night. Please inform your doctor IMMEDIATELY! He or she will know what to do! Oh my, I hope everything will be alright with you. May I know if the clinic at Banaba is still open? Thank you. Hi mam. I was bitten/scratched by a stray cat last wednesday. I was advised to go to San Lazaro hospital to take the Erig Vaccine since I wasn't able to see the cat anymore and I have no idea if it died already or if it is still alive. The problem is that, I cannot afford the Erig vaccine for I am just a student. Luckily, health centers around my area gave me Tetanus Toxoid and the Anti-Rabies vaccine for free. How much did you get yours? I was told that it was 1200/vial. Hi! If my memory serves me right, it's Php 750 per shot. But of course, that was in 2013 so I will not be surprised if the cost has already gone up by this time. :( By the way, kindly ask the doctor from the health center if you can have a series of anti-rabies vaccination just to be sure. What will happen when you eat something and in the ingredients there's egg. And what will happen when I eat carbonara with century tuna? Hi, Diel! Thank you for visiting my now dormant blog (unfortunately). I just read your comment so I hope that somebody else was able to address your inquiry because 3 months have already passed. :( Anyway, for matters like this, I would always suggest consulting a doctor because I, myself, am not very certain of the answer. I really wish that things turned out well for you. Hi Ma'am sana mabasa niyo at mareply-an niyo pa din 'tong comment ko kahit sobrang tagal na ng post na ito. 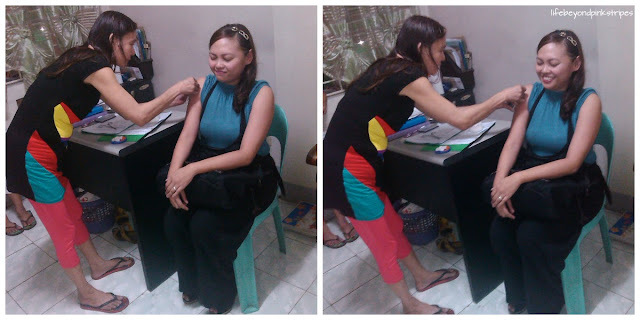 Ma'am ask ko lang kase naturukan din ako nang ERIG vaccine and katulad sainyo may mga pagkain din daw po ako'ng bawal kainin. Ask ko lang Ma'am kung gano katagal kang hindi kumain nang mga pagkain na yan? Or ilang weeks yung sinabi sayo nang doctor mo na bawal kang kumain nung mga ERIG Foods? Salamat. Hi ..Do you have the clinic number please?? I am not really sure if this is still working but I was able to contact Dra. Garcia before via 09055576354. Thanks! Hi. Finollow niyo ba yung food restrictions for two weeks? Thanks! Hi! I did not follow the food restrictions back then. However, it's best to consult with your doctor if there's anything that you need to avoid. Thanks!